2017 was a year of political tumult, chaos and instability. Amidst the triggering of article 50, a snap election, political division, concerns around fake news and continued deterioration in the NHS finances and NHS- pharmaceutical industry relationships, new routes and methods were needed to successfully deliver change. Only through delivering policy and public affairs expertise in a collaborative effort could Hanover’s clients achieve the impact they needed in this period of turmoil. This collaboration – both with the Hanover group and the wider industry – enabled Hanover’s success. 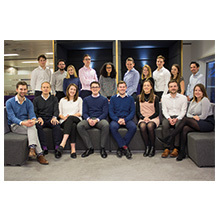 Internal collaboration saw the development of a comprehensive training and development programme and new relationships with other business divisions that supported development opportunities for staff, and the creation of new client programmes. In the external environment Hanover Health was the convening power for industry that brought together leaders from across the life science sector to deliver a successful Life Sciences Industrial Strategy (LSIS) and reshaped the reputation of the industry with Government. The execution of these internal and external collaborations saw the consultancy grow 27% in 2017 and diversify its offer into new areas including cancer, rare diseases and haemophilia, and work with eight of the world’s top ten pharmaceutical companies. Hanover’s presentation and submission gave a strong sense around their trust and integrity, married well with overall vision both within their team and externally. They clearly have a strong team, backed up by investment in talent. They have a laser focus on internal and external collaboration, which has made them trusted and highly-valued partners.